Driving west towards Kingsway along 10th Avenue I was surprised by a throbbing roar from behind. At the next stop light, a drill team of twelve gleaming black motorcycles and burly blue-clad officers pulled alongside. Both the car and my body vibrated with mechanical thunder. What stunning beauty: raw power and pure testosterone riding the line between protection and menace. When I entered the Alan Emmott Center adjacent to the Nikkei Center in Burnaby to attend Vancouver Ikebana Association’s 50th Anniversary celebration, the contrast couldn’t have been more marked. Here was quite another display of power. What elegant beauty: evanescence and stillness poised at the intersection of nature, philosophy and art. 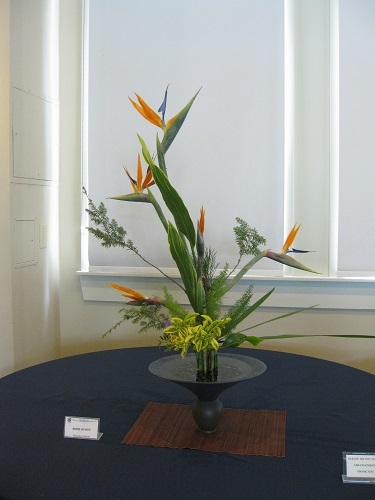 On blue-draped tables stood displays from Ikebana (Japanese flower arrangement) schools operating in the Vancouver Metro area: Ikenobo, Kado-Sumi, Ohara, Sangetsu, and Sogetsu. Clusters of people—mostly women—quietly moved along the aisles to study and admire the works on display. To mark the anniversary, for the first time the association arranged a simultaneous demonstration from four artists representing four schools: Rose Scott from Ikenobo, Barbara James from Kado Sumi, Joan Fairs from Sangetsu and Hollis Ho from Sogetsu. Greta Kos provided commentary to explain the respective schools’ distinguishing features. Meanwhile, each artist used the same materials to create distinct arrangements in the style and according to the rules of their respective schools. In addition, each expressed her individual sensitivity and imagination which is another key component of the Ikebana art form. 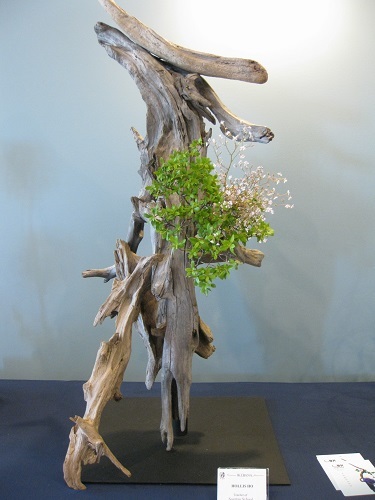 Using plant materials and cultivating a meditative awareness of nature, Ikebana artists practice “the way of flowers.” This Japanese form of floral design emphasises the natural line of living things over form or colour. Additional components focus on the symbolism of individual flowers or greens. Always central to the composition is the awareness of mono no aware. The transience of things. The pathos of things. Ephemeral blossoms—like all of life and its wrenching beauty—soon pass into oblivion. 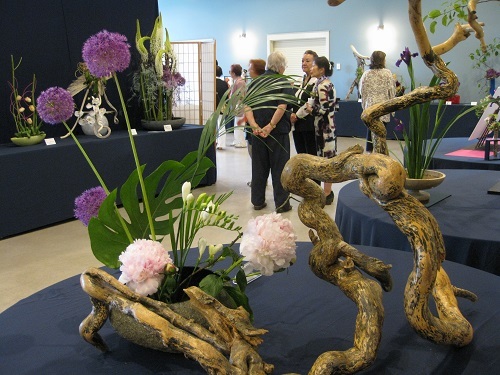 Note: The Vancouver Ikebana Association regularly presents demonstrations of Ikebana art in many venues in the Metro area. The next will be at the Vancouver Buddhist temple during the Powell Street Festival (August 1-2, 2015). 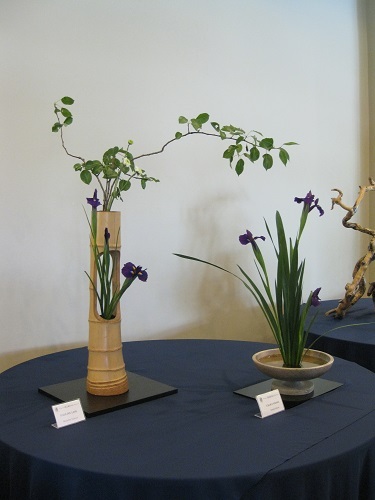 This entry was posted in Japan, Travel & Culture and tagged Ikebana, Vancouver Ikebana Association. Bookmark the permalink.